Written by Douglas Bullis. Illustrated by Norman MacDonald. At age 21, Ibn Battuta “set out alone, having neither fellow-traveler in whose companionship I might find cheer, nor caravan whose party I might join, but swayed by an overmastering impulse within me, and a desire long-cherished in my bosom to visit these illustrious sanctuaries [of Makkah and Madinah]. So I braced my resolution to quit all my dear ones...and forsook my home as birds forsake their nests. My parents being yet in the bonds of life, it weighed sorely upon me to part from them, and both they and I were afflicted with sorrow at this separation.” He did not return to Tangier until 1349, some 24 years later. Despite his travels and his book, Ibn Battuta was not a travel writer in the modern sense. Four things can help us today understand what we read about his experiences between 1325 and 1354. First, though the book is commonly referred to as "the Rihla," that" is not its title, properly speaking, but its genre. (The title is Tuhfat al-Nuzzar fi Ghara'ib al-Amsar wa-'Aja'ib al-Asfar, or A Gift to Those Who Contemplate the Wonders of Cities and the Marvels of Traveling.) The Prophet Muhammad's traditional injunction to "seek knowledge, even as far as China" had the effect of legitimating travel, or even wanderlust, and, in the Islamic middle ages, gave rise to the concept of al-rihla fi talab al-'ilm, travel in search of knowledge. In Islamic North Africa in the 12th to 14th centuries, as paper became increasingly widely available, educated men began to pen and circulate first-hand descriptions of their pilgrimages the Holy Cities of Makkah and Madinah. Such an account was called a rihla, or "travelogue," and it combined geographical and social information about the route with the writer's description of and emotional responses to the religious experience of the Hajj. The rihla is thus a category of Arab literature which Ibn Jubayr and, almost a century later, Ibn Battuta brought to its finest flowering. Though Ibn Battuta's Rihla is, at its roots, a work of devotion, its distinction from other works in the category lies in the vast sweep of the writer's secular accounts: He embraces geography, politics, personalities, natural history, local customs and his own exploits, all mostly very far afield from the Holy Cities and the established routes of pilgrimage. Ibn Battuta enlarged the scope of the rihla genre. Second, the Rihla is a memoir. There is no evidence that Ibn Battuta took any notes that survived his peregrinations. 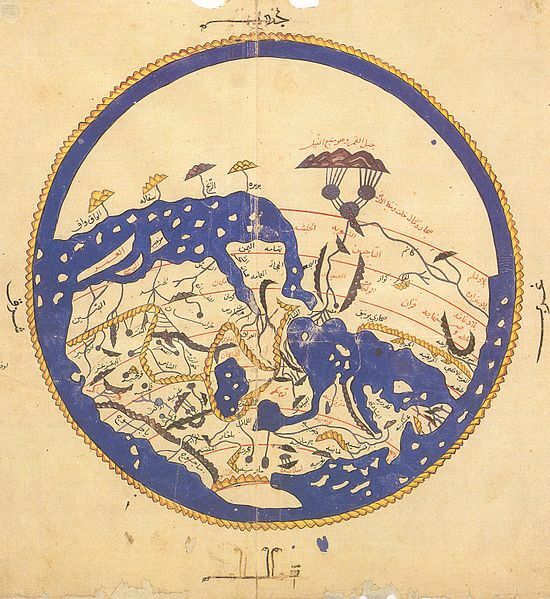 Indeed, writing the Rihla was not even the traveler's own idea: It was the brainchild of the Marinid sultan of Fez, who saw reason to record what Ibn Battuta had experienced—or, at least, what Ibn Battuta was able and willing to recall of his experiences. Given this fact, and the duration and complexity of Ibn Battuta's sojourns, his many gaps, inconsistencies and self-regarding embellishments are more understandable. Marco Polo (English pronunciation: /ˈmɑrkoʊ ˈpoʊloʊ/); Italian pronunciation: [ˈmarko ˈpɔːlo]; c. 1254 – January 8, 1324) was a Venetian merchant traveler from the Venetian Republic whose travels are recorded in Il Milione, a book which did much to introduce Europeans to Central Asia and China. He learned about trading whilst his father and uncle, Niccolò and Maffeo, travelled through Asia and apparently met Kublai Khan. In 1269, they returned to Venice to meet Marco for the first time. The three of them embarked on an epic journey to Asia, returning after 24 years to find Venice at war with Genoa; Marco was imprisoned, and dictated his stories to a cellmate. He was released in 1299, became a wealthy merchant, married and had 3 children. He died in 1324, and was buried in San Lorenzo. Il Milione was dictated by Marco Polo to Rustichello da Pisa while both were prisoners of the Genova Republic. Rustichello translated it from Venetian Language to Tuscan dialect, subsequently embellished, copied by hand and adapted by many others; there is no authoritative version. It documents his father's journey to meet the Kublai Khan, who asked them to become ambassadors, and communicate with the pope. This led to Marco's quest, through Acre, and to the Mongol court in China. Marco apparently wrote of his extensive travels throughout Asia on behalf of the Khan, and their eventual return after 15000 miles (24000 km) and 24 years of adventures. Their pioneering journey inspired Christopher Columbus and others. Marco Polo's other legacies include Venice Marco Polo Airport, the Marco Polo sheep, and several books and films. He also had an influence on European cartography, leading to the introduction of the Fra Mauro map. NO THEME IS MORE CENTRAL to the history of the second millennium than the rise of the West. Perhaps no educational task is more urgent since the attacks of September 11, 2001, than to gain a clear understanding of the history of relations between Islam and the West. The voyages of Ibn Battuta, the world’s greatest pre-modern traveler, focus our attention on the critical turning points leading to the divergent paths between Islam and the West over the past six centuries. Exploring when and how those paths diverged may enable two great civilizations to rediscover how much they have in common and to embark on a course of respectful co-existence and renewed cooperation in the 21st century. Ibn Battuta’s remarkable travels at the dawn of the modern global age help us to ask the right questions. How did Europe emerge as the center of a modern global system? What explains the acceleration of change in the West? Why not in the Middle East, China, India or one of a number of other regions? The answers are less obvious than traditionally assumed and remain intensely debated and researched by historians. The answers are also relevant to decisions that will shape the 21st century. Ibn Battuta was born into a Moroccan family of Muslim legal scholars in 1304. After studying law, he left in 1325 for the hajj, the pilgrimage to Mecca required of Muslims who are financially and physically able to accomplish it. As he circled Mecca’s Grand Mosque, observing fellow pilgrims of diverse languages, races, and ethnic and geographic origins, he must have realized that he would be welcomed anywhere in that enormous inter-communicating world stretching from West Africa to East Asia.